New Version of Yahoo! Messenger for the Web released ! – Save your thumbs! 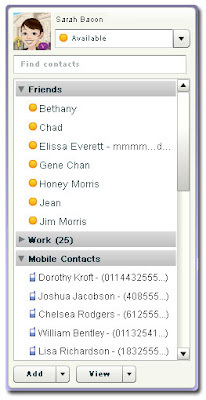 Now you can send text messages (SMS) to your friends’ mobile phones for free, right from Yahoo! Messenger for the Web. – Brand new, local language versions for Thailand and Indonesia. – 9 new languages for the Indian version (Hindi, Marathi, Gujarati, Bengali, Punjabi, Malayalam, Tamil, Telugu, Kannada). Friendvox - Facebook IM Client Coming This Week ? MSN Messenger 7.0.0820 for Windows XP released ! Pidgin (formerly Gaim) 2.2.0 released ! Windows Live Messenger 8.5 Beta 2 released !